Work the way you're used to working with the Type Cover designed for Surface 3. 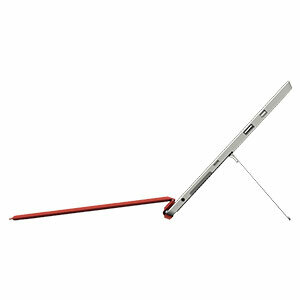 Enhanced with magnetic stability to keep the Cover steady, you can work just as comfortably on your lap as at your desk. When you add a type cover to Surface 3, it becomes a highly versatile laptop. Work like you always have in even more places. One of the thinnest mechanical keyboard available, Surface 3 Type Cover has the speed and functionality of a classic laptop keyboard. It’s backlit so you can continue working after the lights go out. Easy attach and disconnect lets you set up and get going right away. Surface 3 Type Cover features a QWERTY keyboard, a full row of Function keys (F1-F12), Windows shortcut keys, and media controls, so you can navigate expertly. An ultra-thin touchpad lets you control the cursor with your fingertip. 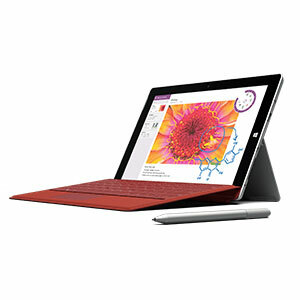 Fold Surface 3 Type Cover back like a magazine for a tablet experience with Surface 3. The Type Cover keys are disabled when the cover is flipped back to avoid inadvertent typing. When you close Surface 3 Type Cover, the display shuts down, which helps protect the screen from bumps and scratches. 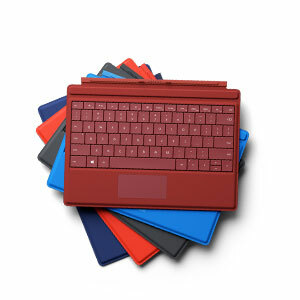 Surface 3 Type Cover is available in a variety colors so you can express your personal style. Choose from black, dark blue, red, bright blue, bright red. With improved stability to work well on your lap, the Type Cover turns Surface 3 into a premium laptop.